Liquid cooling Nvidia's Pascal-based GeForce GTX 1080 graphics card seems to be the trendy thing as of late, and that means you have options. One of them, as reported on yesterday, is Zotac's GeForce GTX 1080 ArcticStorm with a full-length waterblock that you can plug into your existing liquid cooling setup. Don't have one? Well today Corsair announced the Hydro GFX GTX 1080 with an all-in-one liquid cooled solution already attached. The 8GB of GDDR5X memory is clocked at 10,010MHz in Silent and Gaming modes, and goosed slightly to 10,108MHz in OC mode. Each mode is selectable through MSI's Afterburner overclocking software, which also allows you to tweak things on your own. 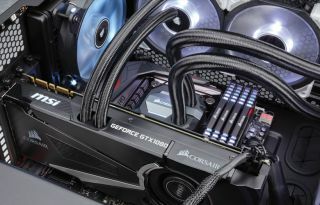 Corsair says its cooler keeps the card up to 50 percent chillier than stock cards while running up to 10 percent faster. It accomplishes this with an integrated Hydro Series H55 cooler that draws heat from the GPU using a micro-fin copper base cold plate and a 120mm radiator. All of the pieces are pre-fitted and fully-sealed—you just have to mount the radiator. The Hydro GFX GTX 1080 is available now only from Corsair's webstore for $750 (£699.99).